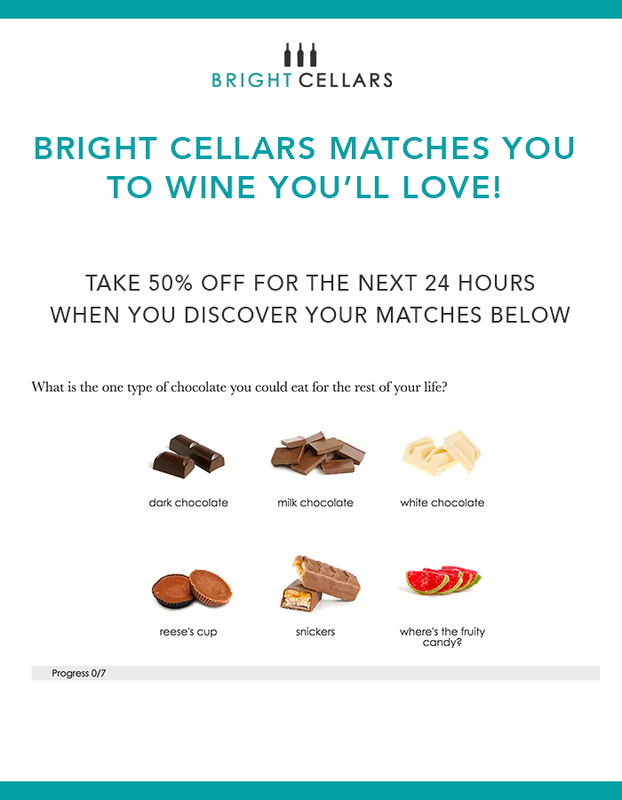 Win 3-months of personalized wine matches from Bright Cellars! Wine! It's "WIN" with an E.
One lucky winner will get their very own Bright Cellars account where they can take our taste palate quiz and get matched with wine they'll love. If you win you'll get 4 bottles of wine per month, for 3 months. That's 12 bottles of wine matched to your personal taste preferences. Take the wine quiz now and you'll get 2 bonus entries PLUS 50% off your first box of wine from Bright Cellars! The Win 3-months of Wine Giveaway (the “Sweepstakes”) starts on 7/10/17 (at 12:01am CST) and ends 10/31/17 (at 11:59pm). ELIGIBILITY: The Sweepstakes is open to any individual who is, as of the Start Date aged 21 years old or older and for shipping and/or regulation reasons, does not reside in Alaska or Hawaii. Sweepstakes subject to all applicable federal, state and local laws and regulations. Misrepresentation of age, upon discovery by Sponsor, will disqualify the applicable participant. Due to wine shipping regulations a winner residing in Utah or Texas will be awarded a credit to Bright Cellars equal to or greater than the designated prize amount to be used for cheese subscription. Employees of Sponsor and their respective parent companies, subsidiaries, affiliates, divisions, advertising and promotion, fulfillment and/or judging agencies, and related entities (collectively, the “Released Entities”), and their immediate family members (spouse, parents, siblings, children and their spouses) regardless of where they reside and/or those living in the same household of any such individual (whether or not related) are not eligible to enter or win. By entering this giveaway I agree to receive marketing and promotional emails from the participating brands.